(CNN) - Campaign signs sprout from the ground here at Northwest Regional Library, an early voting site in Coral Springs, Florida. Standing in front of the polls, two candidates on the ballot are having a conversation. "The tragedy happened six months ago," the candidate for the District 4 seat on the Broward County School Board, Lori Alhadeff, says. "School started, and we need to make those changes now. We can't make another mistake." "If we get on the board together, we'll both bring that energy that will impact all the schools around the county," the candidate for the District 8 seat, Ryan Petty, replies. "We'll get this. We'll get the change made." The November midterms will determine whether Democrats or Republicans are destined to control Congress for the next two years, and most of the nation's attention has been focused on the House and Senate seats that are up for grabs. But the school board race in Broward County, Florida, is a reminder that local politics are often just as passionate -- and just as controversial. The mass shooting that left 17 dead at Marjory Stoneman Douglas High School on February 14, 2018, has thrust the issues of school safety, mental health and gun violence into the forefront of the race. Petty, Donna Korn and Elijah Manley are running in the nonpartisan yet politically charged race for the District 8 at-large seat on the board. All three have faced criticism for some of their comments or actions. Alhadeff, who lost her daughter Alyssa in the shooting at Marjory Stoneman Douglas High School, is running for the open District 4 seat. For all four candidates, the race is personal. The primary election takes place on August 28. If one candidate gets more than 50 percent of the vote, he or she wins the seat. If not, the two candidates with the most votes will face a run-off election on November 6. Korn, a single mother of three and a former teacher, has held the countywide seat for seven years. Republican Gov. Rick Scott appointed her to the position, but she switched from the GOP to no affiliation this year. Korn has received big endorsements from the Broward Democratic Party and the local newspaper, the Sun Sentinel. The incumbent candidate faced criticism from families of the Parkland victims after her comments during a district-wide meeting on August 9. 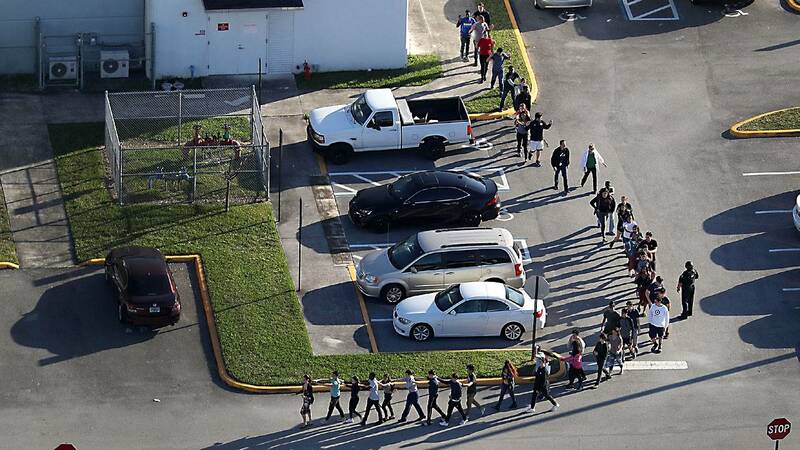 In the meeting, Korn said that the district was coming off of an "amazing school year," according to a tweet by the district's director of school safety and security, April Schentrup, who also lost her child in the Parkland shooting. In a statement following the meeting, Korn said her words were "poorly chosen." She said she intended to acknowledge the district's achievements "and not disregard the pain and loss" from the shooting at Marjory Stoneman Douglas High School on February 14. Stand With Parkland, a group made up of the shooting victims' family members, has called for the entire school board to be replaced. "I can only imagine that if I lost a child, I would be looking for someone to be responsible for that," Korn told CNN. "Nikolas Cruz is responsible, but I think sometimes we just feel like we need to keep reaching beyond, and I understand where they're coming from. But as a board member, I couldn't feel any more deeply for those families." The school board was recently criticized after canceling a pilot program to test out metal detectors at Stoneman Douglas right before the school year began. Korn says the board made the decision after school safety consulting firm Safe Havens International brought up potential risks associated with the plan. "We don't want to jump so fast that we're doing something that isn't having the impact that we need it to have," Korn told CNN. "It has to actually have an impact on making our schools more safe, and not just feel like they are, they actually have to be." Korn says the board has agreed on the necessity of a crisis line for students to call in emergencies, approved funding for upgraded security cameras, and are asking taxpayers to vote for half a million dollars in additional resources that will go toward a goal of having one school resource officer, or armed guardian, for every thousand students. She says that they aim to have single point of entry in place at all schools in the county in 2019. But some say the board's actions aren't enough. Neither Petty nor Manley has held a political office -- Petty is a telecom executive, and Manley, a sophomore student at Broward College -- but what they do possess is frustration with how the board has handled concerns from parents and students. Petty's 14-year-old daughter, Alaina, was one of 17 people killed in the shooting at Marjory Stoneman Douglas High School. "She was an angel. She was our baby girl, and we miss her a lot," Petty told CNN. "Like most parents that have experienced this kind of tragedy, you want to try to explain it. You want to try to understand it. You want to try to understand how something like this could happen." After the shooting, the Florida Legislature established the Marjory Stoneman Douglas Public Safety Commission, a committee tasked with investigating the attack. Gov. Scott appointed Petty to serve on the committee alongside public officials and law enforcement officers. Petty -- who is a Republican and supporter of 2nd Amendment rights -- has been endorsed by the Broward Republican Executive Committee. Despite his party affiliation and the endorsement, he says school safety shouldn't be about political labels. "The gun debate comes to the foreground immediately, and it's a divisive issue," Petty explained. "Ironically, by focusing on school safety, we've actually gotten more gun control legislation passed in Florida than any group that's just been solely advocating for gun control. That's the irony of this." Petty, as well as Manley and Korn, have come out against arming teachers, although a bill signed by Scott after the shooting would allow some teachers and staff to carry guns in school. Petty's campaign took a hit about a month before the polls opened. In late July, the Sun Sentinel reported that Petty had posted tweets, mostly from 2008 to 2013, that contained controversial remarks about guns, gays, minorities, unions, Jews, Muslims, liberals and public education. When asked about the tweets, Petty told CNN that he never intended to have a political career, and the comments were taken out of context. "It's easy to pull words out, look at them in isolation and ascribe whatever meaning you want to them," Petty said. "Clearly, that's not what I stand for." Manley, a recent graduate from Fort Lauderdale High School, has attended Broward County School Board meetings since he was in 8th grade. At 19, he is the youngest and most progressive candidate running for the District 8 seat. He says he was motivated to run because the current board lacks a student voice. "I want to provide younger people with the chance to have our ideas heard and respected," Manley told CNN. In addition to improving school security, he says the board should also address socioeconomic issues. "Our school board needs to work with other government officials and other government entities in Broward County to work hard to ensure that poverty is not an issue for our students," he said. Manley began his campaign before the shooting at Stoneman Douglas and says the incident changed the way he views politics in Broward County and his role as a candidate. "It has never been like this before," Manley said. "Now we see that younger people's voice is being actually considered as part of the political process. I think that's going to be a big part of the upcoming midterm elections, and I think it's going to be a big part of the 2020 presidential elections as well." On August 24, four days before the primary election, the Sun Sentinel reported that Manley spent thousands of campaign dollars on restaurants and Uber rides as well as a $2,000 consulting fee to a person with a false identity. When asked about the article and if he worried that it would hurt his credibility as a candidate, Manley told CNN, "As a first-time candidate, I made a mistake in reporting information. That is common for first-time campaigners." All three candidates bring diverse experiences and perspectives to the table, but they share a common goal: making schools safer for students. They each agree school shootings are preventable. "The students are a vital source of information," Petty said. "We say 'if you see something, say something,' but as adults and as a school district, we have to do something. When they see something and say something to us, we have to act." "How do we see what's happened and make sure it doesn't happen again?" Korn said. "That's our job. Our job isn't to say, what could have happened, it's what happened and how do we move forward? How do we do good by every single one of our kids?" "We have absolutely no more time to wait," Manley said. "We've waited long enough, and now we're dealing with a crisis in our county. This is our lives, this is our education, this is our future, and we deserve to make the decisions on how our future should move forward."